'S e dùthaich ann an Afraga a tha ann am Poblachd Meadhan Afraga,  ainm eile:Poblachd Mheadhan Aifric,  (Fraingis: République Centrafricaine, IPA: ʀepyblik sɑ̃tʀafʀikɛn, neo Centrafrique, IPA: sɑ̃tʀafʀik). Tha i suidhichte ann am Meadhan Afraga. Tha crìochan aice sa tuath leis an t-Siad, san ear le Sudàn agus Sudàn a Deas, sa deas le Poblachd na Congo agus le Poblachd Dheamocrach na Congo agus san iar le Camarun. 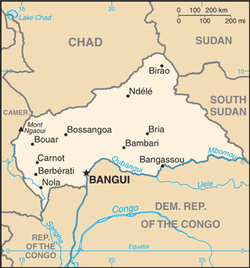 'S e Bangui am prìomh-bhaile. Tha 2/3 den dùthaich a’ laighe timcheall air an abhainn Ubangi a tha a’ ruith gu deas dhan abhainn Congo, agus tha 1/3 den dùthaich a’ laighe timcheall air an abhainn Chari, a tha a’ ruith gu tuath do Lake Chad. Tha a' Phoblachd seo aon de na dùthchannan as bochda air an t-saoghail. Air a tharraing à "https://gd.wikipedia.org/w/index.php?title=Poblachd_Meadhan_Afraga&oldid=495357"
Chaidh an duilleag seo a dheasachadh 3 dhen Ghiblean 2015 aig 13:55 turas mu dheireadh.